Not all Fairies are classy and just drink wine - and being a fairy is hard work. 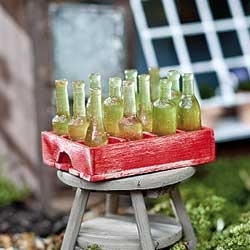 Put out a crate of their favorite Lager in the garden and see the fairies flourish with relaxation and happiness! Crate is .5"h x 1.5"w x 2.25"L; Bottles are 1.25"h.